صادقی, منصوره, مهرانی, هرمز. (1395). بررسی و تجزیه وتحلیل بسته بندی محصولات،حفظ محیط زیست و هزینه های مرتبط. بررسی‌های بازرگانی, 14(79), 88-104. منصوره صادقی; هرمز مهرانی. "بررسی و تجزیه وتحلیل بسته بندی محصولات،حفظ محیط زیست و هزینه های مرتبط". بررسی‌های بازرگانی, 14, 79, 1395, 88-104. صادقی, منصوره, مهرانی, هرمز. (1395). 'بررسی و تجزیه وتحلیل بسته بندی محصولات،حفظ محیط زیست و هزینه های مرتبط', بررسی‌های بازرگانی, 14(79), pp. 88-104. صادقی, منصوره, مهرانی, هرمز. بررسی و تجزیه وتحلیل بسته بندی محصولات،حفظ محیط زیست و هزینه های مرتبط. 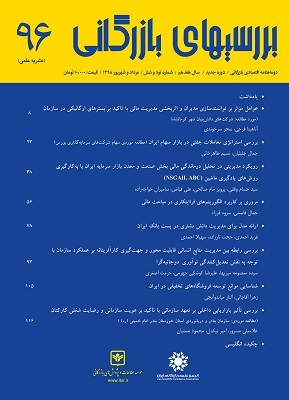 بررسی‌های بازرگانی, 1395; 14(79): 88-104. مقررات مسئولیت‌پذیری گسترده تولیدکننده در اتحادیه اروپا نتوانست ترویج بسته‌بندی دوستدار محیط زیست را ترویج کندکه دلیل اصلی آن استفاده از ابزارهای اقتصادی به ویژه هزینه تولید کننده در آن است.در این مقاله، به منظور بهبود اثر هزینه تولیدکننده، هم از جهت ارتباطی و هم از جهت تأثیرگذاری بر کیفیت بسته‌بندی، یک مدل ریاضی برای محاسبه هزینه‌های متغیر پایدار تولید کننده پیشنهاد شده است. توسعه این مدل شامل گام های زیر است: انتخاب معیارهای پایداری، یکپارچه سازی معیارهابا استفاده از شیوه تصمیم‌گیری چندمعیاره، فرموله کردن محاسبه هزینه متغیر پایداری تولید کننده و یکپارچه سازی سیستم تعاملی تارنما پایه برای شرکت های بسته بندی و واردکنندگان برای محاسبه هزینه متغیر خودشان.جنبه های پایداری مورد نظر شامل ابعاد اجتماعی مرتبط با ارزیابی اثرات چرخه حیات بسته بندی(مانند گرم شدن کره زمین و مسمومیت انسانی) و جنبه های اجتماعی مرتبط با ارائه اطلاعات در مورد بسته بندی(مانند نماد سطل زباله و اطلاعات اثرکربن) هستند. مدل ریاضی توسعه یافته از نتایج پایداری که توسط شیوه تصمیم گیری چند معیاره ارائه شده است استفاده می کند.اگر سطح پایداری پایین باشد یعنی این که اثرات زیست محیطی و اجتماعی منفی باشد،هزینه ها از هزینه های فعلی بیشتر می شود و بالعکس.در تجزیه و تحلیل حساسیت، کم ترین هزینه برای بسته بندی پلی اتیلن محاسبه شد.بیشترین ارزش به بسته بندی PVC بدون مواد بازیافت و بدون اطلاعات محیطی اختصاص یافت. Algar. Physical Characterization of Municipal Solid Waste at a Multi-municipal Waste Association in the Algarve Region. Final report (in Portuguese) 2010. Bello-Dambatta, A., Farmani, R., Javadi, A. A., Evans, B. M.. The analytical hierarchy process for contaminated land management. Adv. Eng. Inf. 23, 433- 441, 2009. Bovea, M. D., Gallardo, A. The influence of impact assessment methods on materials selection for eco-design. Mater. Des. 27, 209-215,2006. Brouillat, E., Oltra, V. Extended producer responsibility instruments and innovation in eco-design: an exploration through a simulation model. Ecol. Econ. 83, 236- 245,2012. Chang, N. B., Pires, A. Sustainable Solid Waste Management: a Systems Engineering Approach. IEEE Book Series on Systems Science and Engineering. Wiley-IEEE Press, Hoboken, New Jersey, 2015. Dempsey, M., van Rossem, C., Lifset, R., Linnell, J., Gregory, J., Atasu, A., Perry, J., Sverkman, A., van Wassenhove, L. N., Therkelsen, M., Sundberg, V., Mayers, C. K., Kalimo, H. Individual Producer Responsibility: a Review of Practical Approaches to Implementing Individual Producer Responsibility for the WEEE Directive. INSEAD Working Paper no. 2010/71/TOM/INSEAD Social Innovation Centre, 2010. Eco-Emballages. Green Dot Contributory Scheme: a More Accurate, More Fair and More Focused on Price Ecodesign. http: //www. ecoemballages. fr/entreprises/bareme-contributif-point-vert-un-tarif-plus-precis-plus-equitableet-plus-axe-sur-leco (accessed 15. 04. 14.) (in French),2014. Forslind, K. H. Does the financing of extended producer responsibility influence economic growth? J. Clean. Prod. 17, 297-30, 2009. Guin_ee, J. B., Gorr_ee, M., Heijungs, R., Huppes, G., Kleijn, R., de Koning, A., van Oers, L., Wegener Sleeswijk, A., Suh, S., Udo de Haes, H. A., de Bruijn, H., Huijbregts, M. A. J., Lindeijer, E., Roorda, A. A. H., van der Ven, B. L., Weidema, B. P. Handbook on Life Cycle Assessment: Operational Guide to the ISO Standards. Kluwer, Dordrecht,2002. Hwang, K., Yoon, C. -H. Multiple Attribute Decision Making e Methods and Applications: a State-of-the Art Survey. Springer-Verlag, Berlin, 1981. IFU Hamburg. Umberto 5. 5 Software. Institut Für Umweltinformatik, Hamburg GmbH, Germany,2009. International Standard Organization (ISO), 2006a. ISO 14040 Environmental Management e Life Cycle Assessment: Principles and Framework. ISO, Switzerland. International Standard Organization (ISO), 2006b. ISO 14044 Environmental Management e Life Cycle Assessment: Requirements and Guidelines. ISO, Switzerland. Jahanshahloo, G. R., Lotfi, F. H., Izadikhah, M. An algorithmic method to extend TOPSIS for decision-making problems with interval data. Appl. Math. Comput. 175, 1375-1384, 2006. Lazarevic, D., Aoustin, E., Buclet, N.,Brandt, N. Plastic waste management in the context of a European recycling society: comparing results and uncertainties in a life cycle perspective. Resour. Conserv. Recycl. 55,246-259,2010. Lin, Z. -C., Yang, C. -B. Evaluation of machine selection by the AHP method. J. Mater. Process. Technol. 57, 253-258, 1996. Ma, D., Zheng, X. In:. 9/9-9/1 Scale Method of AHP. In: 2nd Int. Symp. AHP, Pittsburgh, PA, USA, pp. 197-202,1991. Mota, M., Pires, A., Ribeiro, R., Martinho, G., 2012. Comparative Study on Fees: the Packaging Waste Case. In: EIMPack Congr. 2012, Lisbon, Portugal. Organisation for Economic Co-operation and Development (OECD). Extended Producer Responsibility: a Guidance Manual for Governments. OECD, Paris,2001. Pires, A., Martinho, G. Life cycle assessment of a waste lubricant oil managementsystem. Int. J. Life Cycle Assess. 18, 102-112,2013. Pires, A., Chang, N. B., Martinho, G. Reliability-based life cycle assessment for future solid waste management alternatives in Portugal. Int. J. Life Cycle Assess. 16, 316-337,2011. Plastics Europe. Eco-profiles., http: //www. plasticseurope. org (accessed10. 01. 13.),2013. Pordata, 2012. Waste. http: //www. Pordata. pt/Tema/Portugal/Ambiente‏‏Energia‏e‏Territorio-23 (accessed 20. 01. 13.) (in Portuguese). PRO Europe, 2015. Overview. http: //www. pro-e. org/About. html (accesed 15. 06. 15). ProBas. Zum ProBas Projekt. www. probas. umweltbundesamt. de/php/index. php? (accessed 15. 01. 14.),2013. Ribeiro, P. J. T. Food Packaging: Contributions to the Definition of Ecoefficient Policies in Portugal. Dissertation for MSc. Degree in Engineering and TechnologyManagement by Instituto Superior T_ecnico, Lisbon (in Portuguese),2002. Ribeiro, R. A., Moreira, A. M., Broek, P. V. D., Pimentel, A. Hybrid assessment method for software engineering decisions. Decis. Support Syst. 51, 208-219,2011. Silva, P. G. S. Environmental Innovation in the Management of Beverage Packaging in Portugal. Dissertation for MSc. Degree in Engineering and Technology Management by Instituto Superior T_ecnico, Lisbon (in Portuguese),2002. Spicer, A. J., Johnson, M. R. Third-party demanufacturing as a solution for extended producer responsibility. J. Clean. Prod. 12, 37-45,2004. Triantaphyllou, E. Multiple Criteria Decision Making Methods: a Comparative Study. Springer, London,2000. Valorlis. Multimunicipal Action Plan e Suitability Plan for PERSU II – PAPERSU (Plano de acç~ao multimunicipal e Plano de adequaç~ao ao PERSU - PAPERSU). In Portuguese (Valorlis),2008.
van Rossem, C., Tojo, N., Lindhqvist, T.,. Extended Producer Responsibility e an Examination of its Impact on Innovation and Greening Products (Report for the Greenpeace International, the Friends of the Earth and the European Environmental Bureau),2006. Verghese, K. L., Horne, R., Carre, A. PIQET: the design and development of an online ‘streamlined’ LCA tool for sustainable packaging design decision support. Int. J. Life Cycle Assess. 15, 608- 620,2010. Watkins, E., Hogg, D., Mitsios, A., Mudgal, S., Neubauer, A., Reisinger, H., Troeltzsch, J., van Acoleyen, M. Use of Economic Instruments and Waste Management Performances e Final Report. Report for the European Commission (DG ENV),2012.